Home News & Events Exams Already Underway! In January and February 2019 we undertook the first of our 2019 GCSE exams. Business and Health & Social Care pupils sat their exams in January and we wish them good luck with their results. 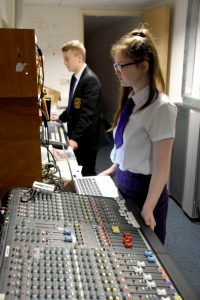 Year 11’s are currently nearing the time that they will sit their English speaking, and Spanish speaking exams, as well as other exams such as Drama. GCSE Drama will be performing excerpts from ‘Girls Like That’, a play by Evan Placey. as part of their final performances. These will be observed by an external examiner. An image from the rehearsals can be seen to the below, preparations are well in hand and we wish them the best of luck!